Is Singapore’s hub status at risk? (June 5): Hardly a day passes these days without some news item that breathlessly reports yet another threat to Singapore’s regional hub position. There is much concern about China’s mega projects under its Belt and Road Initiative (BRI), which some say will create rivals to Singapore. There is also talk about our neighbours’ ambitions to displace Singapore in airports, ports and related services, which are reflected in ambitious schemes to expand their infrastructure. And, if that is not enough, every now and then we are told Thailand will build a canal across the Isthmus of Kra that would completely knock Singapore out of the running as a major port. The good news is that much of this is exaggerated. The bad news is that there are other, potentially existential, threats to Singapore’s hub position that we must face and overcome. Is Singapore still on top of the game? Singapore has one vital advantage: Its head start gives it a critical mass of interlocking activities that cannot be easily replicated by a challenger — a web of high-end financial services, manufacturing activities, business headquarters, superb supporting services of all kinds, high-value tourism attractions, world-class physical infrastructure combined with best-inclass “software” to run it, credible tax, policy and regulatory frameworks, free trade agreements that promote connectivity, and all the flows of goods, services, people and capital that result from it. Each of these items helps reinforce the other items. For instance, businesses locate their regional headquarters here because of the infrastructure, regulatory frameworks and other features, which means that their customers and suppliers have also chosen to be in Singapore. Shipping lines and airlines come here because other shipping lines and airlines are here, providing the connectivity and quick switches so vital to their businesses. The fact is, once established, hubs such as Singapore are difficult to displace. Moreover, some of the big trends remain supportive. Singapore sits at the crossroads of the three most impressive growth stories of all time — China, India and Asean. 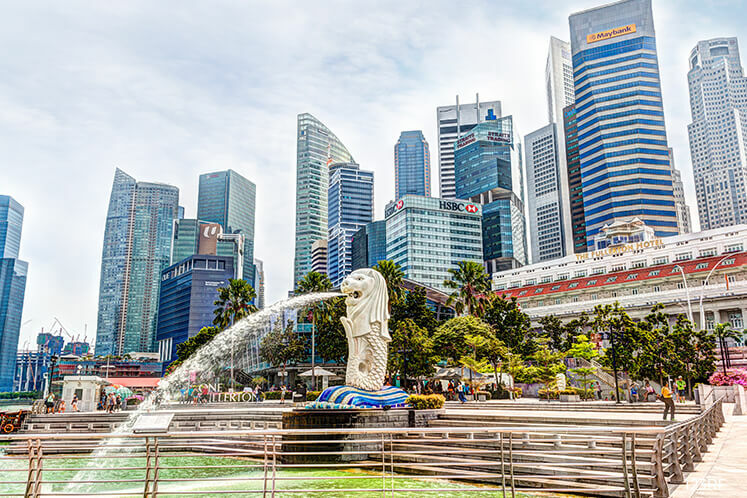 The Asean region that Singapore serves is embarking on a new wave of growth as infrastructure projects and regulatory reforms enhance its growth potential. China’s BRI will promote connectivity within Asia and between Asia and the rest of the world, and that in turn will increase the flows of trade and capital that Singapore’s hub services. In other words, the size of the pie is growing and we can afford to lose some market share without much damage. It is also worth noting that Singapore is working hard to stay ahead. For example, its port operator, PSA, has not been sitting idly by. It has invested heavily in the advanced logistics services that are key to staying competitive. The consolidation of all container handling at the new Tuas port with a capacity of 65 million twenty-foot equivalent units will boost the competitiveness of the Singapore port. It has also shown flexibility in commercial arrangements, proposing, for instance, to give equity stakes in port terminals to major liners. PSA has also invested in new technology such as automated guided vehicles to transport containers within the port. Overall, Singapore retains an edge in most of the determinants of port competitiveness — connectivity, unit costs, infrastructure and operational efficiency. What about the threat of new ports and routes that could bypass Singapore? There are two ways Singapore could be bypassed — with the construction of a Kra Canal, or the creation of a viable rail link across the Malay Peninsula, either across the Kra Isthmus in Thailand or across West Malaysia. At this stage, the financial and economic case for constructing a Kra Canal appears difficult to make. It would be 102km long or 20% longer than the Panama Canal, but about half the length of the Suez Canal. But constructing these other canals was made easier by the presence of large water bodies that could be connected by digging short c hannels that linked them together. The Isthmus of Kra is different; there are no such water bodies and the builders will have to hack through solid mud and rock for years at impossibly high costs to complete the construction. The huge amounts of earth dug up will have to be placed somewhere without causing massive environmental damage. And, unlike the Panama and Suez canals — which cut travel distances by 5,000km and 8,000km respectively — the distance saved by a Kra Canal would be just 1,200km, which means the cost-benefit calculus is not as compelling. One also has to wonder whether the Thai authorities would be happy about creating a canal that can be a natural boundary between its restive southern provinces and the rest of the country. What about a rail link such as the East Coast Rail Link, that would allow cargos to be transported by rail across West Malaysia from Port Klang to Kuantan, bypassing Singapore? This could certainly draw away a part of Malaysia’s trade with China, which would no longer have to be shipped via Singapore. But it is doubtful whether the economics of shipping freight to Port Klang, unloading it there, reloading it onto the railway, and unloading and reloading it at Kuantan before resuming the sea journey really makes sense for other types of cargo. Yes, there are many other port projects underway in Malaysia, such as the Melaka Gateway and massive expansion of facilities in the vicinity of Port Klang, such as the Pulau Carey project. Indonesia is also investing in expanded port facilities in Batam and west Java that will compete with Singapore. This will increase the competition for Singapore, but it is also worth noting that rapid economic growth means there is also a lot more business to be shared among these ports. So, what does Singapore really have to worry about? Business headquarters: In the past decade, Singapore did well in attracting MNCs as well as internationalising Chinese and Indian companies to locate their regional headquarters here. Regulatory pushbacks in areas such as tax may take some of the shine off the proposition Singapore offered these global firms. High costs are deterring more Chinese and Indian firms from placing their international operations in Singapore. Third, we live in an age of disruptions. New technologies are threatening the business models that benefited incumbent players such as Singapore. More nationalistic policies could limit the globalisation that the country thrived on. Singapore should also consider far bolder regional initiatives such as working with Malaysia and Indonesia to revive the Growth Triangle of the 1990s, which encompassed Singapore, Johor and the Riau Islands. This initiative showed much promise 20 years ago but lost its way after the Asian financial crisis. As our neighbours are pre-occupied with their many challenges, Singapore may have to take the lead by conceiving projects that excite them and that it could offer to fund, such as transport ation projects to link up the region. Over time, challenges to Singapore’s hub status will grow and incremental responses are unlikely to suffice. Singapore needs to consider bolder and potentially riskier responses that will create a hinterland encompassing southern Malaysia and the Riau Islands, one that can compete with the other emerging clusters of economic vibrancy elsewhere in Asia.